A new poll of America’s youth finds that three-quarters of voters aged 18-29 plan to sit out the 2014 midterm elections, a significant drop compared with recent years. The Harvard Institute of Politics (IOP) poll found that just 23 percent of younger voters said they would “definitely be voting” in the midterm elections, an 11-point drop from a similar poll conducted in December. Those results could be problematic for Democratic candidates, who have benefited from a surge in the youth turnout, particularly during President Barack Obama’s 2008 campaign. Though overall youth turnout appears set to decline, young Republican voters are more enthusiastic than their Democratic counterparts. Thirty-two percent of self-identified young conservatives said they are likely to vote in the midterms compared with 22 percent of liberals, according to the IOP poll. Men also appear more inclined to vote than women, 28 percent to 19 percent, and whites (27 percent) appear more likely to vote than African-Americans and Hispanics (19 percent). Overall, 44 percent of young voters who supported Mitt Romney in 2012 say they plan to vote in the midterms, compared with 35 percent of Obama voters. 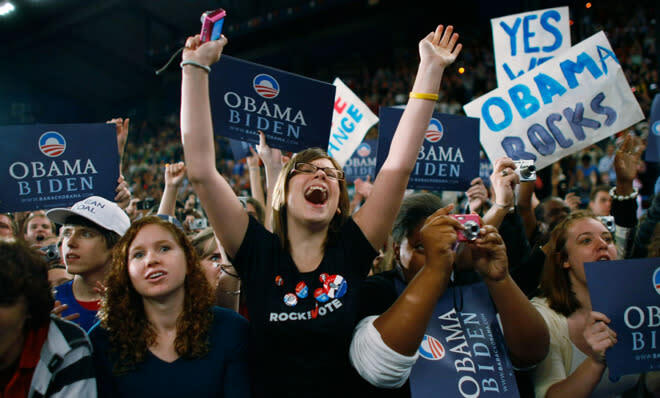 Obama’s youth turnout dropped by more than 2 million votes in the 2012 election compared with 2008. The bulk of that drop was the result of young voters staying home, as opposed to voters switching from the Democratic to the Republican column. Of course, the youth vote is just one indicator of potential turnout in the midterm elections. A Democracy Corps poll released on Monday found a more encouraging story for Democrats, noting that voters — particularly independents — are warming to the Affordable Care Act (ACA). Criticism of the ACA has been the lead talking point for Republicans seeking federal office across the country, and any softening of opposition to the health care law would presumably be a net gain for Democratic candidates. Further complicating the picture, a Washington Post/ABC poll released Tuesday has generated headlines over finding that Obama’s job approval ratings have continued to drop, hitting a new low in this survey. And yet Democrats hold a slight advantage over Republicans in potential midterm matchups in the survey, with 45 percent of respondents saying they’d vote for the generic Democratic candidate in their district, verses 44 percent who say they’d vote for the Republican. Democrats also enjoy a plurality of support on a number of social issues including health care, the middle class, abortion and marriage equality. And while only 30 percent of respondents said they thought Democrats should be re-elected to Congress, the numbers were even worse for Republicans at 25 percent, confirming once again a national mood of widespread anti-incumbent opinion.